There’s this thing about wine/, tasting it, drinking a glass is meant to be a shared experience. Visiting a vineyard can be an intimate occasion when you get to crumble the soil between your fingers and hear the story of the year, the harsh frosts, and rainless winter months, a wet spring that threatened to ruin the intensity of the final wine, and the narrowly dodged late season hailstorm which nearly wiped out the entire harvest. But at the upper end of the market, I’m thinking particularly of Bordeaux, and now even Provence, the gates of Chateaux are barred and tasting impossible without an appointment. This month I wanted to start a series about the great wines of Provence. The idea was to kick off with Chateau Simone, just outside Aix. The white wine from this estate is a bit of a joke in our family. My father-in-law keeps giving me a few bottles as a present. He is terribly munificent about the whole thing when he hands over the bottles, and yet by the following morning the wines have been added to his cellar. Initially it’s just for safe keeping to ensure they are maintained at the right temperature but after a week or so he conveniently forgets he has given them to me at all. It’s quite possible he’s given me the same bottles three or four times now. Anyway, he’s a man who knows his wine, and for him Chateau Simone is one of the very best that Provence can produce. I’ve realised, that Stuart (that’s my father in law) is never going to permanently give me a bottle, so I phoned up to arrange a visit. I was told to email my reasons for wanting a tasting. Knowing that the Aixoise have a tendency to be a little snooty, I laid it on thick, I was none other than Jamie Ivey, the wine writer who famously beat Oz Clarke’s encyclopedia on Bordeaux into second place to take the coveted 2006 Gourmand Prize for Book of the Year on French Wine etc…. I waited for a response. Nothing. I phoned again. What I was proposing was a tour of the vineyard, a quick tasting and then a nice article for the guru website. The phone went dead. 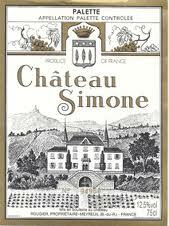 Now Chateau Simone can apparently sell all its wine without bothering to make tasting its wine an intimate experience. The wine, apparently, speaks for itself, there’s no need for the vigneron to shake your hand, look you in the eye, and proudly tell you about his year’s work. If you believe this, then snap up some bottles this summer, as I mentioned according to my father in law, there are few better bottles in Provence. However, if, like me, you believe that a glass of wine is about more than the liquid in the bottle, if you want a bit of romance, if you want to feel some way linked to the history in the bottle before you, don’t bother with Chateau Simone, it might leave a bad aftertaste. We lived just up the road from Château Simone for several years, and my youngest daughter used to love to go up and explore the grounds. I’d heard of their unfriendly reputation, and was always so relieved we were never caught!